Imagine yourself on a really steep hill. Your rig has given up and it's still a long way to the top. You're by yourself in the rig and everyone else with you is already at the top, cheering you on (and laughing at you for not making it). You're in a precarious position and can't let off of your brake pedal. You call out "winch!" and some unlucky Joe gets to hike 50 feet down the hill. Check out a video demo of the semi-automatic clutch! So down down down he goes, he flips the clutch lever on your winch, grabs the line and climbs back up the hill - way back up the hill. Joe's a conscientious guy so he hooks the line up to a tree strap around a nice big tree and tosses a blanket over the line in case it breaks so it falls to the ground. All set to winch, right? Wrong! Joe's got to go back downhill to flip the clutch lever back to engage it. Oh, and he also has to get the remote to you or hang out in the danger zone with it to control your ascent. Oh, wait, scratch that last bit. 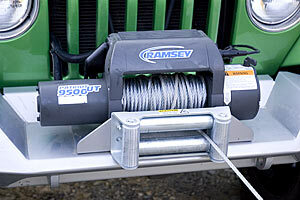 You have the new Ramsey 9500UT winch! Joe doesn't have to hike back down to engage it. It'll do that automatically when you reel the line in. Ah, yes! You also handed him your wireless remote control fob, so he can control the winch from the top of the hill (or hand it to you to control from the driver seat). So did you catch that part about the clutch engaging itself? Yeah, that's right. Just hit the IN button and "flick" - the semi-automatic clutch lever engages. How cool is that? 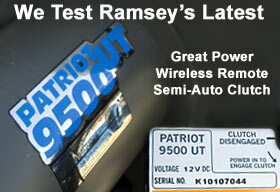 The Ramsey 9500UT (Ultimate Technology) electric winch is the latest in the tried-and-true Patriot line. 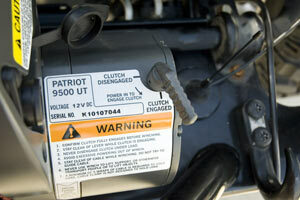 Based on the very successful Patriot 9500, the 9500UT has an updated look, including the new solenoid and gear housings, and better seals throughout to better protect the winch from the elements. We've run Ramsey winches on our rigs over the years and have always loved them. They have stood the test of time, and frankly, a good bit of abuse! So we were very excited to check out the new 9500UT at Superlift's park in Hot Springs, Arkansas. 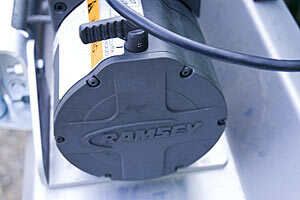 The Ramsey 9500UT mounted on a FabFours bumper. This bumper allows for very low mounting for extra air flow. Ramsey gave us the grand tour but, of course, we were really interested in getting our hands on one. 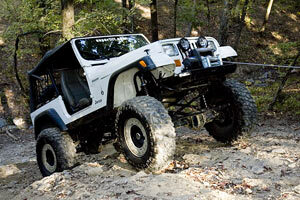 Soon enough, we were on the trails for some real-life testing. We took a few Ramsey-equipped rigs to a very steep hill and began playing. We were already familiar with the Patriot's 9,500 lb. rating, the 5.5 HP motor, and three-stage planetary gear setup. But what we hadn't seen in the real world was the awesome semi-automatic clutch. Driving the Jeeps into position, we'd grab the line and head uphill and basically recreate the scenario described above over and over. A touch of the IN button and the line would engage and pull the Jeeps up the hill - exactly as planned. A new side plate shows the new Ramsey styling. The semi-automatic clutch rocks and is very easy to use. Line speed of a 9500UT is 12.7 feet per minute with a 4,000 lb. load (see full specs on page 2). 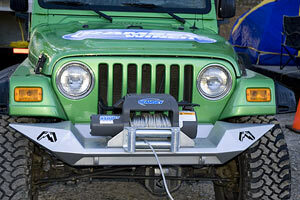 While this isn't the fastest winch on the planet, the speed is very good, and frankly, in our experience, faster is not always better. The Ramsey gives plenty of speed while keeping your rig under control as it moves over rocks and pitches itself on the trail. We like the assurance given by the speed of these winches, as there are no surprises as you make your way to safety. In addition, the Ramsey stops quickly when you let go of the button. Other winches on the market tend to run on for a bit - again, not our preference for safe, controlled winching. Putting the 9500UT to the test in Hot Springs. 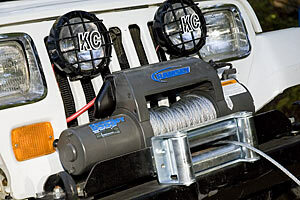 This winch is mounted to the YJ with an additional winch mount. The 9500UT comes with Ramsey's remote control system, which consists of a receiver unit, an antenna with magnetic mount, wiring, and a remote control key chain fob. The unit installs very easily and plugs in where the included wired remote would go. You can easily swap out remote lines whenever you like. We've already covered the installation of the remote units in previous stories. You can read up on that here. The wireless is specified to work up to 50 feet away, though environmental variances can alter that plus or minus. Michael Cohn is the Editor and founder of ROCKCRAWLER.com. If he could have mounted a winch on his pedal car, he would have, though it would have been just a wee bit heavy up front there.